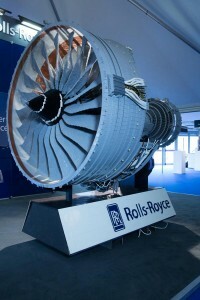 To celebrate the opening day of the 2012 Farnborough International Air Show, Rolls-Royce plc has unveiled an emission-free aircraft engine. 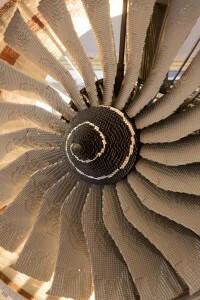 The Trent 152,455 weighs over 300kg and measures more than 2 meters long and 1.5 meters wide. 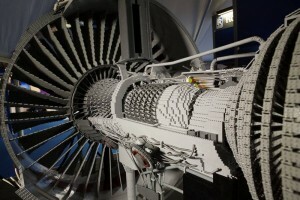 It is made up of 152,455 components and took 1,280 hours to build. But this world-leading engine produces no thrust and would not be capable of transporting any passengers. It’s built entirely from LEGO. The innovative model was created to engage young people in science, technology, engineering and maths, and to demonstrate how exciting careers in high-technology engineering can be. A team of Rolls-Royce graduate trainees worked with LEGO specialists Bright Bricks to come up with the design, which is one of the most complex LEGO structures ever built.